306 in stock Need More ? Reprint. Originally published: London: Methuen Children's, 1993. "Wise old man, won't you help me, please? My house is a squash and squeeze. 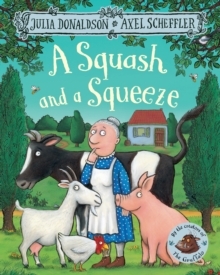 "Visit the farm in the brilliantly funny A Squash and a Squeeze, the first ever picture book written and illustrated by the unparalleled picture book partnership of Julia Donaldson and Axel Scheffler, creators of The Gruffalo. A little old lady lives all by herself in her house but she's not happy - it's just too small, even for one. Whatever can she do? The wise old man knows: bring in a flappy, scratchy, greedy, noisy crowd of farmyard animals. When she pushes them all out again, she'll be amazed at how big her house feels!This edition features the classic story with a stunning, redesigned cover and beautiful finish, making it a must-have addition to the bookshelves of all Donaldson and Scheffler fans - big and small!Also available with redesigned covers are: The Gruffalo, The Gruffalo's Child, Room on the Broom, The Snail and the Whale, The Smartest Giant in Town, Monkey Puzzle and Charlie Cook's Favourite Book.